Shinichi decides to reach out to the person who created the website about Koya being a murderer. He gets a response back from “Maki”—the sites administrator. Before she will give him any details about Koya, Shinichi will first have to answer some questions to determine if he is a fellow comrade. Only after that will Maki answer his questions. Maki asks for a brief introduction which he gives. The second questions asks if there is anyone he can trust. Shinichi thinks about this for awhile and says there is. He says that he can trust his parents the most. What a lie. You know that Shinichi doesn’t trust his folks one bit. He then lies about trusting his teachers. He even slashes one of their bicycle tires. He then talks about trusting his friends and girlfriend. Another lie. Sheesh. There are times he can’t even be bothered to respond to his girlfriend. The next question asks about Koya’s treatment of Shige. This is where Shinichi is very honest. He talks about locking Shige in his room so he can’t get out, instigating the bullies, and the party fiasco. During this we cut to see Shige at school where he’s isolated from his classmates. After school he gets approached by a girl and nearly falls over trying to avoid her. Imagine his surprise when she takes out a letter to give to him. After that she goes off with her friend leaving Shige alone and puzzled. Shinichi explains that all of this has caused Shige to become completely dependent on Koya, thus making Shinichi even more worried. Maki then says that Shinichi has already lied to her twice. If he really had people he trusted, he would not have consulted her to begin with. The second lie is when Shinichi said he was concerned for his brother. Funny. She says the exact same things to Shinichi that Koya told him. Shinichi then spies on Koya who is reading the love letter Shige got from Mano. Maki asks if Shinichi is jealous of the fact that his little brother now has someone to talk to and confide in and trust. Shige is all happy about the letter, but Koya quickly laughs and says it isn’t a confession, but a consolation letter. Shige scolds Koya for laughing at him and we cut to Maki asking if Shinichi is the lonely one instead of Shige. Koya notices Shinichi leave and says “Good” once more. Such a confusing drama. It’s hard to tell if Koya is good or bad. Actually, there is no good or bad in the strictest sense. Everything is not what it seems and morals are really a grey issue. We also explore what lies underneath the surface of the “perfect” family. Kazu and Kayoko sit down with Shige and Koya to see the boy’s grades. There isn’t a huge improvement, but there is some. Koya promises that he will improve even more by the next test. Kazu tells him that if he can get Shige into the top half of his class at that time, then he will get a fat bonus. Koya is quick to agree to this. Shinichi goes to leave for cram school and Kazu asks Koya to take over tutoring Shinichi as well since his grades are starting to slip. Shinichi assures his parents he is fine and leaves. Koya and Shige then go upstairs to continue studying. This leaves the Numata parents alone and talk about the epitome of awkward silences. Kayoko starts clearing up the coffee dishes when her husband vows to break things off with Asami. Instead of going to cram school Shinichi goes to a net café where Maki says she knew the truth as there was no humanity in his replies. She then says this will be the end of their correspondence. Shinichi then reintroduces himself. He’s a 16-year-old who pretends to be the perfect honor students. His friends, parents, and girlfriend do not know the real him at all. He trusts no one other than himself, or rather he looks down on everyone. Shinichi then reveals he only wishes to know more about Koya since Koya knows one of his weaknesses, thus the tutor is a hindrance that must be taken care of. Listen to me. Friendship is empathy. Love is intuition. Having the empathy necessary to gain friends takes time, however, the intuition needed to gain a lover is a one shot to feel the pull of fate—I can direct that. Shige still refuses, but Koya reminds him that he has no choice since Shige became his dog. Koya then says they should think of a reply to the letter. Enter Kazu who asks to speak to Koya. The two go to the sauna as per the norm and Kazu asks about the birthday party fiasco. 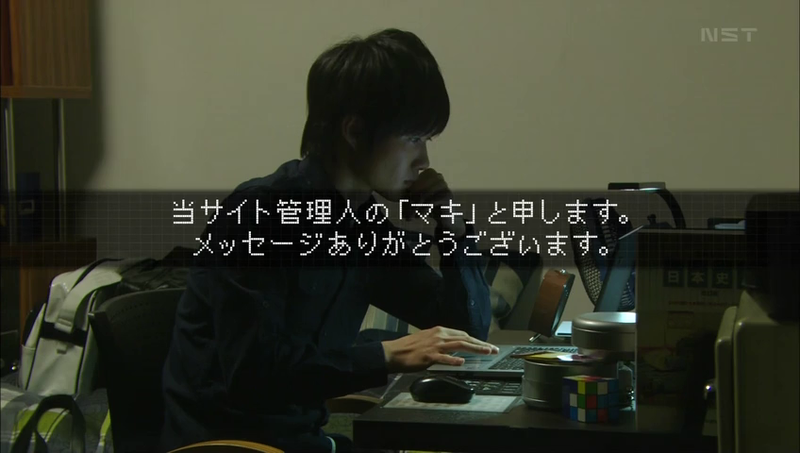 He had questioned Shinichi about the video and Koya’s name came up. Koya then says that it was a total accident and he then tries to strangle himself with his towel. Kazu stops him and then asks if Koya is certain he wasn’t the one who eavesdropped. Koya assures him that he didn’t and only found the tape. Then who is the culprit? So…what did Koya do with the original? He destroyed it so Kayoko wouldn’t find it. Somehow I doubt it. He then tries strangling himself again and is again stopped by Kazu. This time Koya leaves the sauna all cocky and unaffected. Of course, Koya shows a different face and shares a different story with Kayoko. He asks her what she does to relieve stress since she refuses to actually buy into the internet stocks. She used to write a diary but stopped after Shige went to middle school. Then how will she relieve stress after learning about Kazu’s affair? He then holds up a wiretap device and explains that he rigged the whole situation as he could not stand to see Kazu sneaking around behind her back when Kayoko has been working so hard. Kayoko is surprised by this, but then immediately asks if he was the one who emailed all of her friends about Kazu walking closely with some girl. This surprises Koya and he assures her it wasn’t him. Koya says it is obviously someone who is trying to destroy the Numatas’ relationship. So…Asami? She’s a troublesome woman, isn’t she? So Asami does whatever she can to get rid of her opponent. Kayoko then says that’s enough talk about her husband and that the situation doesn’t bother her in the slightest. Lies. Shige then comes home and Koya asks him if they should head out to the library. Only they don’t go to the library, they go to skating rink instead. Koya then hands over a file he has compiled all about Mano along with a drafted reply for her letter. In it, Shige asks Mano to go inline skating. Shige says that is news to him and says it’s impossible for him to learn to skate since he’s never done it before. Koya then tells him to look at page 19. Shige opens Mano’s file and there are pictures of her skating. It’s her hobby. This goads the boy to try. He’s terrible at it as expected. Koya then leaves the boy to learn on his own while he returns back to the Numata house. Shinichi is in his room where Maki accepts him as her comrade for finally telling her the truth. Maki reveals she is a 21-year-old freeter and that her family attempted a family suicide 3 years ago thanks to Koya. Shinichi then hears some odd thumps and goes to check them out. He finds Koya rummaging in one of their closets. Shinichi says he can shout about it and Koya counters with spreading the shoplifting pictures around. The two then end up back in Shinichi’s room. Koya is looking through the diaries he found. It turns out the Numata parents met at an omiai. Isn’t Shinichi the least bit curious to learn more about his parents? Not in the least. Koya packs Kayoko’s diaries and goes to leave. He then mentions that Shinichi hasn’t been picking fights of late. Shinichi replies such things are a waste of time with college entrance exams and national tournaments coming up. Koya tells him that’s good as now they can get along fine. Kazu meets with Asami and tells her they cannot meet anymore since his wife found out. Kazu then says that Asami deserves a younger, cooler guy than him. Asami asks him to be honest and just admit that he hates her. Kazu says he doesn’t hate her at all and Asami says that is fine then. Kazu goes to get her a taxi and she kisses him before leaving the stunned father behind. At school, Numata puts his reply in Mano’s locker and we see her talking to her friend about it. She didn’t mean that letter as a confession—Koya was right! But she is interested now that Shige said he inline skates. Mano’s friend is horrified—is Mano really considering Shige who shat himself? We then cut to Shige praying in the classroom. The head bully is not happy when he learns that he confessed to Mano and decides that Shige has had more than enough peace. Mano delivers her response personally and in it she asks to meet Shige at 1 at a bridge on Founder’s Day since they have no school. Enter the bullies. Is that a suicide note? Honestly, Shige had no intention of dying, right? Shige quickly swallows the note and the bullies gather to hold him and retrieve it. Too late, LOL. Shige is then thrown to the ground. Koya waits for his pupil at home when he picks up a book off the shelf and begins reading off all of this history information. He finishes and slams it down on Shige’s desk and says “good.” Is that how he studies up to tutor Shige? Anywho, Kazu comes home and tells his wife it’s over between him and Asami, not that he ever did anything with her. Kayoko makes no reply as she is on her laptop with headphones on. Enter Koya. Kazu asks where Shige is and Koya says he is probably practicing his inline skating for his date with a girl. Kazu is slightly surprised to hear that his youngest has a son he likes, but just goes upstairs. Kayoko then pops up. Is it true what Koya said about Shige having a girl he likes? Koya grins. Kayoko has a bad temper (meaning she pretended not to hear her husband when she could). Koya then talks about how excellent Mano is as a student and how this will be an incentive for the boy to study harder. Kayoko complains that is dishonest and Koya counters with how is it worse than trying to raise your social status by studying? He then turns and seriously asks Kayoko to keep watching over Shigeyuki. The boy finally comes home and tries to keep his face averted, but Koya won’t let him and Kayoko and the tutur see how horribly red half of Shige’s face is. What happened? Koya asks if it was from inline skating practice. Shige quickly takes this bone and laughs and said he fell down again. Koya then marches the youngest Numata upstairs. Shinichi is learning more about Maki. She was studying abroad when Koya came into her family’s lives and tore them apart. She warns Shinichi to be careful when intervening as Koya is very dangerous. Koya sits in the empty school breathing heavily. We cut to a flashback of a clean cut Koya at a school talking with a student (the ghost from the earlier episode) about some matter. Koya doesn’t believe the student, but the student begs Koya to help him. The flashback ends and Koya squeezes the straw doll and continues to breathe heavily. Slowly. Slowly we are learning more. Koya is helping Kayoko make homemade pasta while Kazu sits on the coach watching TV. The older man is stunned when Koya asks his wife for a date. This also surprises Kayoko. Koya says it is to spy on Shige’s first date. Before Kayoko can reply, Kazu immediately jumps in and says that is impossible. Won’t it make their son angry? Besides, Koya is just a tutor and should not be interfering in the family’s personal lives like he has been. Kayoko then shocks her husband by saying she will go. All of this is watched by Shinichi. The day of the date dawns and Shige gets up extra early to choose an outfit, primp and prepare. He even reads up on Mano’s file! He chokes on breakfast and chokes on brushing his teeth before leaving the house. Kayoko then meets up with Koya. Is it really okay for them to do this? Koya tells her “Welcome to Wonderland” and sweeps his arm out. The two then rush off to follow Shige. They watch him wait for the girl and Kayoko worries that Shige is being tricked, and is relieved when Mano shows up wearing a very cute outfit. The two then head to the skating rink followed by Koya and Kayoko. At the rink, Koya laughs about Shige not getting enough practice in. This surprises Kayoko…her son doesn’t know how to skate? She looks back out and Shige falls down. This startles her and she jumps out of her seat. Mano laughs and says that Shige isn’t good at this at all and holds out her hand. Koya then laughs as he gets a text from Shige showing a cool expression. The boy has no idea that they are there seeing just how uncool he is. Shinichi spies on both his little brother and his mother and Koya from a distance as well. Figures. Koya and Kayoko continue to watch Shige and Mano and Kayoko smiles genuinely happy to see such an expression on Shige’s face after all of this time. She then says its frustrating. Because she couldn’t bring that expression back? Shinichi then texts Maki asking her why she thinks Koya asked his mother out on a date to watch Shige. Koya then says doesn’t it have something to do with wanting to show Kayoko her son’s growth. This shocks Shinichi and he jumps. Koya then asks if the boy wants juice. Shinichi ducks down and asks how long Koya noticed he was following them. For a long time now. Shinichi then starts barraging him with questions behind his actions. Koya replies that he doesn’t want to see Kayoko become even colder to Kazu, that’s why he’s doing all of this. He then takes Shinichi over to his mother and lies saying he called Shinichi there since the older boy cares so much about his younger brother. As a trio, they then stalk Shige and Mano on the next part of their date. Kayoko is taken aback by their destination. Koya urges her and Shinichi to hurry and follow. Inside as Kayoko watches Shige’s awkwardness with Mano, she recalls her and her husband’s date at the same restaurant. Koya then asks if seeing Shige’s poor performance reminds Kayoko of Kazu. He knew? How did Koya know? Koya doesn’t answer and just smirks. Kayoko then explains to Shinichi that was the restaurant where Kazu proposed to her. She again tries to ask how Koya knew, but he motions for her to pay attention to Shige…who has all the same awkwardness and mannerisms and even expressions as his father. I have to say it was sooo cute to see Shige finally ask for Mano to never let go of his hand. Kayoko watches nervous for her son while Shige asks Mano to go out with him. I thought she would initially refuse, but Mano agrees making Shige and his mother very happy. This also makes Koya happy and he goes over to Kayoko’s table and gives her a high five and then claps. The youngsters leave the restaurant followed out by the stalking trio. Mano takes the initiative to hold Shige’s hand. Kawaii. Shinichi excuses himself to go to cram school. Koya goes to head off as well, but Kayoko stops him. She was planning on parting ways with her husband once Shige had become an adult. Until then, she would live by pressing herself to death (emotionally, I believe). Koya says that has changed now, hasn’t it? Why does he say that? Because Kayoko is making a great face now. Koya turns to leave once more and Kayoko smiles. That night Kazu sees Kayoko waiting for him outside of work. The two make their way towards one another. Kazu asks what is wrong and Kayoko lies and says she thought it might rain so she brought an umbrella. Kazu looks up and smiles, no matter how you look at it, it isn’t raining. The two then start the walk home together. Kayoko holds the umbrella in the same hand as her purse and Kazu switches his briefcase into his other hand so that he can hold hers. Won’t it be bad if someone sees them? Nope. Well…could their relationship really be on the mend? Shinichi comes home to find the neighbor ladies gossiping. They stop when they see him and start again as he walks on by. When he gets upstairs, he finds Koya in his room on his computer viewing Maki’s website. Shinichi closes his door and lights into Koya for the hypocrisy of breaking the marriage and then using Shigeyuki to help repair it. Honey…the marriage was broken already. Koya just brought the issues out into the open. Koya gets up and stands toe to toe with Shinichi. He then says 50 points and promises to teach Shinichi the textbook answers. Kayoko is outside going to spray her trashcans when the neighbors approach and show her the email of Asami kissing Kazu. Shinichi asks what is going on and Koya replies that he used the other woman’s tactic to send an anonymous message himself of Asami kissing Kazu. The damage is as he expected. Shinichi glares at the tutor. What does he mean? Koya reminds him about what he said earlier about how it would be bad if Kayoko becomes colder and colder towards Kazu, thus he is reigniting the flame of passion. Wowza. Koya then says that love is easily something that turns to hate. We then cut to Kayoko handing the phone back and saying there must be a mistake before she walks lifelessly away. Shinichi watches in worry and demands to know why Koya asked Kayoko to go on that date. Koya smiles and says that Kayoko is really broken, isn’t she. Should he start on Kazu next? Koya then grabs an envelope and dumps out the shoplifting pictures. Shouldn’t Shinichi be scrambling to hide them? Shinichi obviously bluffs and says he doesn’t care who finds out. Koya then shows him pictures of him kissing a girl other than his girlfriend and him slashing the teacher’s bike tire. Koya then says he can easily end Shinichi’s life. The younger boy asks if Koya really plans to destroy his family like that. Koya says that since teachers can’t change a student’s home life, then he will do it. Shinichi calls this insane and Koya says it cannot be helped since the country is already distorted. I really wanted to get all of Koya’s speech down when he talks about how bad and formulaic education is, but he talks way too fast and spews out way too much. He basically says that education is in serious need of reform and that it strips students of their identity until society becomes what is has today where a person must be dependent on another person. Shinichi has no idea just what Koya is talking about and says it has nothing to do with “them” (the Numata family I’m assuming). Koya angrily grabs his collar and says it does have something to do with them. In response to such education, humans have been immersed in a blur of peace and unknowingly can’t feel the malicious intent! We immaculately corner the weak. Koya then flashes back to the student saying it is true and to believe him. Koya yelled at him and said the problem was already resolved and that the boy should think of his position. The boy cries and apologizes and we see that the rope doll Koya has once belonged to the boy. Shinichi is shocked by Koya doubling over an clutching his chest and breathing hard. Koya stumbles out into the hall where he manages to pick up a golf club and goes back into Shinichi’s room. He calls himself Yoshimoto Koya and reminds Shinichi that he was warned not to interfere needlessly. Koya then kills the laptop before demanding Shinichi’s cell. Shinichi tries to escape, but Koya blocks him and throws him down on the bed. Shinichi hands over his phone and Koya throws down the golf club. He kneels on the bed and grabs Shinichi’s hair. He says that he will bring the family down—can they survive it? It’s all just a game after all…a family game! Koya then hands the bonus he got from Kazu for Shige’s test scores over and tells the boy to buy a new computer and phone with it. Shinichi then rushes out of the room and calls Maki thanking her for the warning to prepare a spare cell. Meanwhile, Koya has calmed down and returned to normal. He sits watching anime and munching when Kayoko returns. Kayoko asks to talk to him. She takes him over to the computer and and says she took money from the fixed deposit and will buy the stock she was unwilling to gamble on earlier. Koya smiles. Good. Shinichi heads to some place overlooking the water where he meets Maki who turns out to be Asami! Of course, he wouldn’t know she is the “other woman” since he was absent the night she came to the Numata house. Is she in cahoots with Koya or is she targeting that family for a different reason? I refuse to believe that she really likes Kazu. 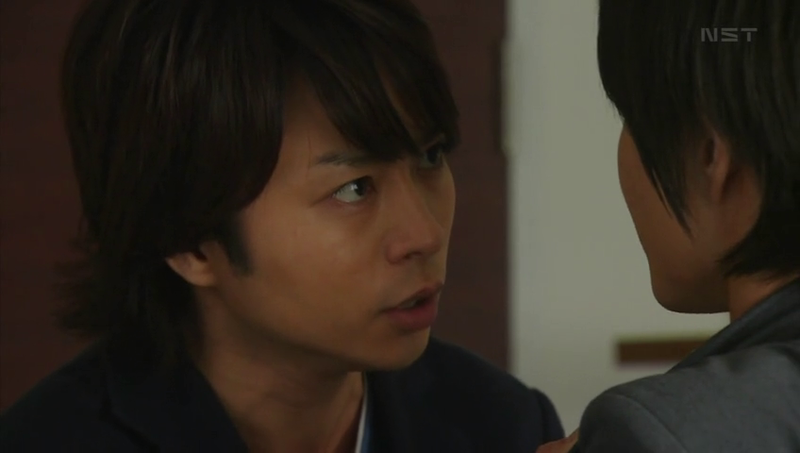 Sho’s acting at the end of this episode…WOW! Amazing. He plays the darker, crazier role so well and looks like he’ll be showing more of his psychotic side in episode 5 as he ends up on top of Asami/Maki threatening to kill her. This is much appreciated. I’ve only found this drama yesterday (two years late!) and it’s turning out to be one of my favorite of all times! 🙂 Thank you for the recap.